As thousands of Texans have evacuated in advance of Harvey, more than half a dozen former Mainers who now call the Lone Star State home said Friday that they planned to weather out the storm, which could be the strongest since Hurricane Katrina, in their own homes. For some, it was their job to stay. Others were trying to protect their property. And for at least one of the former Maine residents, the storm represented a bit of an adventure. At 12:30 p.m. local time Saturday, former Cherryville resident Christa Clark was getting an inkling of what Harvey might bring her way. “I’m in Austin, Texas, right now where we’re getting hammered,” Clarkson said as the high winds gusted across her cell phone’s microphone. “Oh, yeah. You can hear it,” she said of what has been the most powerful storm to hit Texas in more than 50 years, according to Reuters, a news agency. “It’s coming through right now. I live in an RV park full time and we’re right in the thick of things right now. I would say we’re up to 60 mph [winds] right now,” Clarkson said, adding that the rain was coming down hard. 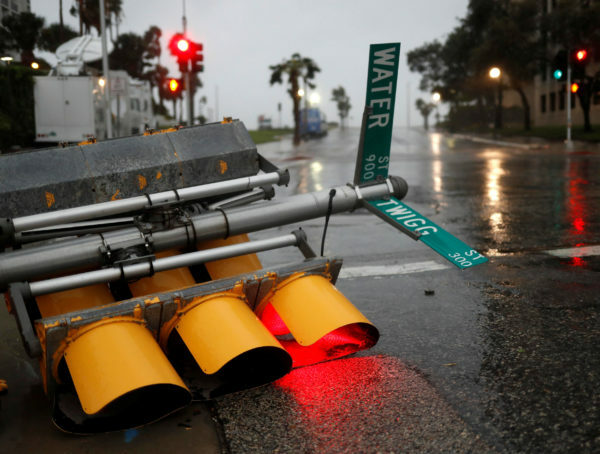 “We’ve probably got, in Austin, 4 inches of rain so far,” she said, adding that the storm struck Friday night but had begun to intensify over the last hour and a half in Austin. “It’s so weird — there’s a plane flying over me right now! Honestly, I see a plane flying into the Austin airport right now. I can hardly believe it,” Clarkson said. “Once in awhile there will be these were strong rain bands [during which] you really can’t see anything. Just white. It’ll look like you’re in a wind wrapped tornado because it’s just super white but it’s not a tornado,” she said. Clarkson had to remain at the RV resort because she is one of the managers. Because several safety precautions had been taken there, the high winds had resulted in minimal damage thus far. Clarkson initially said that she, a co-worker and three RVs owners who decided not to stay in the homes in the park were gathered in an anchor building, or storm shelter, to wait out the worst of the weather. Moments later four others joined them. Harvey made landfall in Texas Friday night as a Category 4 hurricane but weakened as it moved inland. Although Harvey was downgraded to a tropical storm by Saturday afternoon, it already had resulted in devastating flooding in coastal areas, according to Reuters. At its worst, Harvey produced 130 mph winds and torrential rains, making it the most powerful storm to hit Texas in more than half a century, according to Reuters. On Friday and Saturday, several Mainers now living in Texas had opted to stay in their homes rather than evacuate. Ryan Emery is a former Gorham resident now living in Kingsville, Texas, a city of about 25,000. He served in the U.S. Navy from 2003 through 2010 and now is a Navy reservist employed by the Department of Defense. Emery said Friday night that he and his family prepared for the hurricane by making sure there was no loose debris around their home and that they had an adequate supply of water, food and fuel for their generator. “We don’t plan to evacuate at this point,” Emery said. As it turned out, the storm hadn’t hit his community — about 70 miles south of where it made landfall — as hard as some had feared. “We actually got very lucky,” he said, adding that he’d seen little if any damage, unlike some communities directly on the coast. Shawn Bryant, who was born in Presque Isle and grew up in the Ashland and Old Town areas, moved to Victoria, Texas, two months ago. He is working as a concrete form carpenter. While most of the people living in one-story houses in his neighborhood have left for safer places, Bryant said he and several others who live in two-story houses have decided to wait the storm out at home — despite a mandatory evacuation order. Harvey was shaping up to be the worst storm he’d experienced. He said that a tornado touched down near Lawton, Oklahoma, in 2001 when he was in basic training there but no damage resulted. “Other than the Ice Storm of 1998, this’ll be the first major storm I’ve been through,” he said hours before Harvey hit land. Bryant said he understood the risk of not abiding by the evacuation order. “If you stay after a mandatory evacuation order, you’re out of luck” should problems arise, he said. Bryant said he saw the coming hurricane as an adventure, not unlike the ice storm Maine experienced in January 1998. “Everyone is just banding together,” he said. On Saturday, Bryant said the storm had blown trees down on vehicles and buildings and in general, had blown off the front of a small business building and part of a neighbor’s roof and knocked over gas pumps in parts of the city. Christine Morin, formerly of Princeton, is better known as Tina Neptune back in Maine. Morin said Friday that she, her husband and and their teenage son plan to stay in the fifth wheel camper they live in while traveling around the country to her husband’s various construction jobs. Their daughter currently is visiting Maine, Morin said. While she said her husband is taking the storm in stride, she is feeling a bit nervous. Morin said the family had plenty of food and water on hand but noted that very little was left on store shelves when she went out for some last minute purchases. John Bryant, who moved to Matagorda, Texas, about 20 years ago, intends to ride the storm out at the cotton and rice farm he and his family live on. He said at about 9 p.m. Friday that the storm was expected to hit his area within an hour. “I’m worried about my property — looting,” he said when asked why he opted not to evacuate. He did admit to feeling some trepidation about the weather ahead. “I’m nervous. I won’t lie,” he said. Like the others who stayed home, Bryant said he and his family stocked up on what supplies they will need in the days ahead. Rebecca Davis, who lived in Orrington for 20 years before moving to Houston six months ago to be closer to her four sons and grandchildren, said Saturday that everyone was safe and sound in the area around Cypress, Texas, though one of her sons had to evacuate from Victoria. Sophia Moody, who moved from Auburn, Maine, to Galveston, Texas, said Saturday that she, her husband and their 7-month-old baby had chosen to stay home for the storm’s duration but has send their older children to stay with their grandfather in Bryan, Texas, about 2-1/2 hours north of Galveston, which she said is an island with only two ways off — one of them being a ferry service that shut down due to the storm. She said she and heard roughly 10 roads were flooded and did not yet know if the one leading out of town was among them. She said the family had a four-wheel-drive vehicle and planned to head out and see the damage later in the afternoon.